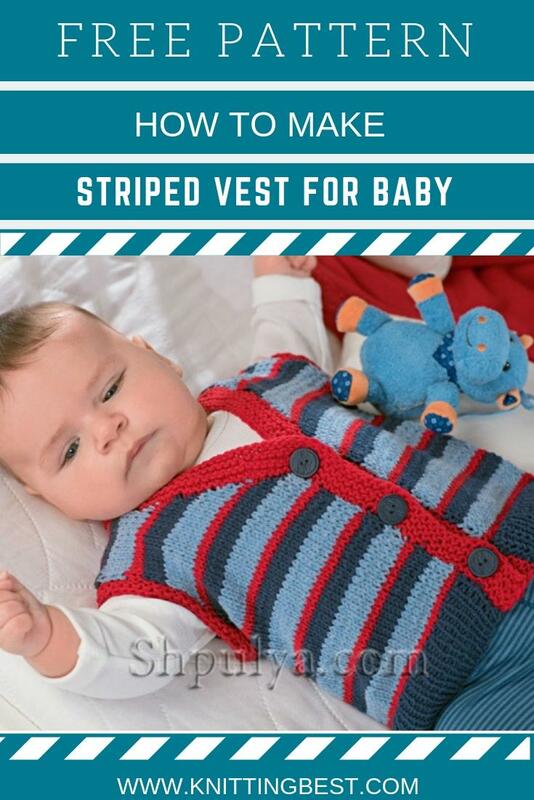 You will need: yarn (55% cotton, 45% polyacryl; 140 m / 50 g) - 50 (100) 100 g dark blue, blue and red; Knitting needles No. 3.5 and 4; 3 buttons with a diameter of 18 mm. Elastic. Knit with needles No. 3.5 alternately 1 facial, 1 purl. Shawl. Knit with needles No. 3.5: front and back rows - front loops. Facial smoothness. Knit No. 4: front rows - front loops, purl rows - purl loops. The sequence of bands. Knit * 2 p. red, 6 p. blue, 4 p. blue thread *, from * to * constantly repeat. When changing the color, the thread is freely pulled up along the edge of the canvas. Back. On the needles number 3.5 dark blue thread dial 64 (72) 80 p. And knit with an elastic band. After 4 cm from the initial row, go to the needles No. 4 and knit the front satin according to the sequence of strips. 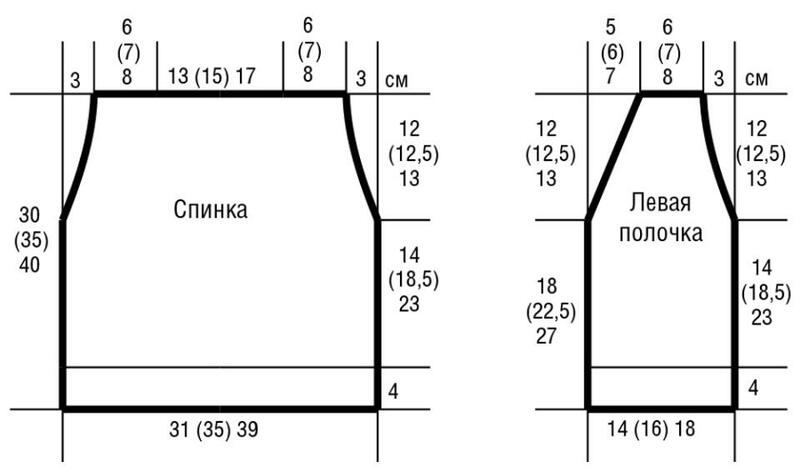 For armholes, after 18 (22.5) 27 cm from the initial row on both sides, close 2 paragraphs and in each of the following 2nd row, on both sides, subtract 4 x 1 section = 52 (60) 68 section. After 30 ( 35) 40 cm from the initial row close all loops. Average 26 (30) 34 points form a neck, external 13 (15) 17 points refer to the shoulders. Left shelf . On the needles No. 3.5 with a dark blue thread, dial 30 (34) 38 points and knit with an elastic band. After 4 cm from the initial row, go to the needles No. 4 and knit the front satin according to the sequence of bands. For an armhole, after 18 (22.5) 27 cm from the initial row from the right working edge, close 2 points and in each of the next 2 rows reduce 4 x 1 points. Simultaneously with the start of the armhole for the neck from the left working edge in each next 2 -m row reduce 11 (13) 15 x 1 p. The remaining rows knit straight. After 30 (35) 40 cm from the initial row, close the remaining 13 (15) 17 points for the shoulder. Right shelf. On the needles No. 3.5 with a dark blue thread, dial 30 (34) 38 points and knit with an elastic band. After 4 cm from the initial row, go to the needles No. 4 and knit the front satin according to the sequence of bands. For an armhole, after 18 (22.5) 27 cm from the initial row from the left working edge, close 2 points and in each of the next 2 rows reduce 4 x 1 points. Simultaneously with the start of the armhole for the neck from the right working edge in each next 2 -m row reduce 11 (13) 15 x 1 p. The remaining rows knit straight. After 30 (35) 40 cm from the initial row, close the remaining 13 (15) 17 points for the shoulder. Assembly. Stretch the details according to the pattern, moisten and allow to dry. Shoulder seams to perform mattress suture. For strips armholes at the edges of armholes on the spokes No. 3.5 with red thread, dial 48 (50) 52 p. And knit 3 rows of garter stitch, then close all the loops. Side seams and stitches seams to perform mattress seam. For the front slats at the edges of the shelves and the edge of the neck with knitting needles No. 3.5, use red thread to evenly dial 139 (163) 187 n. And knit a garter stitch, and make 3 holes for buttons in the 3rd row as follows: in the front row knit 6 p., 1 p. close, knit 12 (14) 16 p., 1 p. close, knit 12 (14) 16 p., 1 p. close. Tie the remaining loops of the row. In the next purl row in place of the closed hinges dial new hinges. After 7 rows of the pattern for the strip 2, close all the loops. Sew buttons.